This section assumes you have gone through the majority of the tutorial videos and want to see how difficult it is to create code. The entire idea behind SQLINQ is the ability to quickly go from a model to code with few steps in the middle. Assuming your model has all the right features, or the Bridge you are using is well written, you should be able to straight to coding once the code is generated. All the pre-written and generated classes are designed to hide away the complexities of dealing with SQLite. There are a few things you have to do to read data and/or write data. 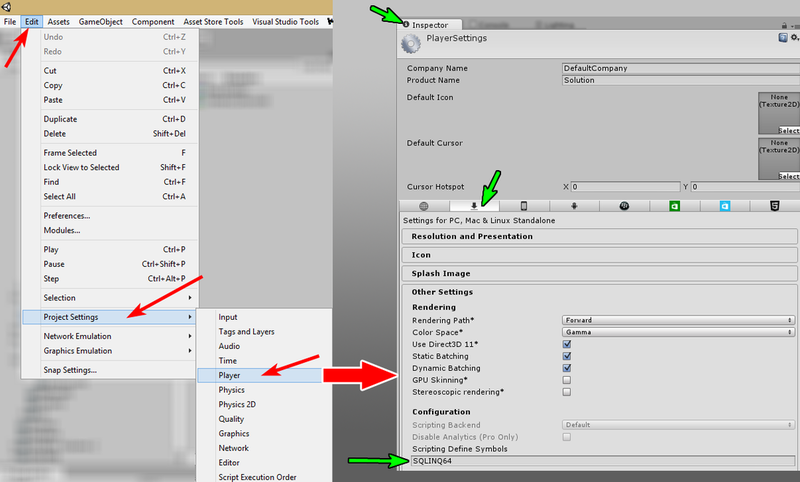 Both versions are included in the plugins folder, but in case you need to upgrade, this the original sourced locations. This class and static method is generated by SQLINQ and it's purpose is to initialize the repository with information about how to transform rows coming out of a database into the objects represented by your class model. This method is only required if you are reading from SQLite, and must be called before your first object is read. It often appears in an "Awake()" method, and it's smart, in that if you accidentally call the method more than once, it exits on the subsequent tries. Note: It's not required if you are only writing objects to the database. This method is required to identify the physical file on the end-users hard-drive. SQLite has no association to a specific file extension (Windows), it simply uses the file as a place to put it's database. SQLite's database is fully self-contained within this file. That means it makes it possible to create temporary copies of the database so that a game could read/write out of the copy and then the game could write it back to it's main location with a game save. SQLINQ doesn't normally keep a file open when writing to the database, so it's possible to copy the file using .Net's File.Copy() method to "save" the database. The only difference between OSX and Windows users is the filename; otherwise the system is functionally identical. You call this method whenever you are creating a database for the first time. It constructs the tables and indexes in an ordered fashion. If you modify the underlying classes SQLINQ will retrofit the database to fit the new data structure, but won't remove columns you removed from your definitions. You can create individual tables by calling Table.CreateTable() directly. You will have to write your own code to retrofit existing tables with new tables yourself, which includes the manual removal of data. Once you have your data, you may want to look at the database or edit the data. See the External Websites page for suggested (free) tools.